Now that the Obama administration has found a possible diplomatic out via Kerry's probably-accidental Syrian deal, the current political schemes are at a critical juncture. Syria's agreed to hand over its chemical arsenal, but Russia's refusing a key section of the U.N. resolution. President Obama's put the congressional vote on hold, and Senator John McCain's saying that's a clear stall tactic. Meanwhile, the Syrian opposition is getting impatient of being on tenterhooks. We know who the major players are in this conflict, but what kind of power does each one actually have? And what's their angle? President Obama's foreign policy approval ratings are at an all-time low, his diplomatic option is the result of a gaffe, and to quote the New Yorker's George Packer, "Assad’s war crime has turned into Obama’s embarrassment." As Mike Doran of the Brookings Institution told the Washington Post : "Having dealt himself the hand of working with Russia and Syria, Obama must play it out. But he could play it aggressively." It's hard to place the Syrian opposition under one heading because the opposition is actually made up of several disparate groups, some of which are as violent as the regime. Some have links to Egypt's Muslim Brotherhood, some are affiliated with Al-Qaeda. According to the UN, groups of rebels have perpetrated full-on massacres against the Syrian people and have even shelled civilian neighborhoods. 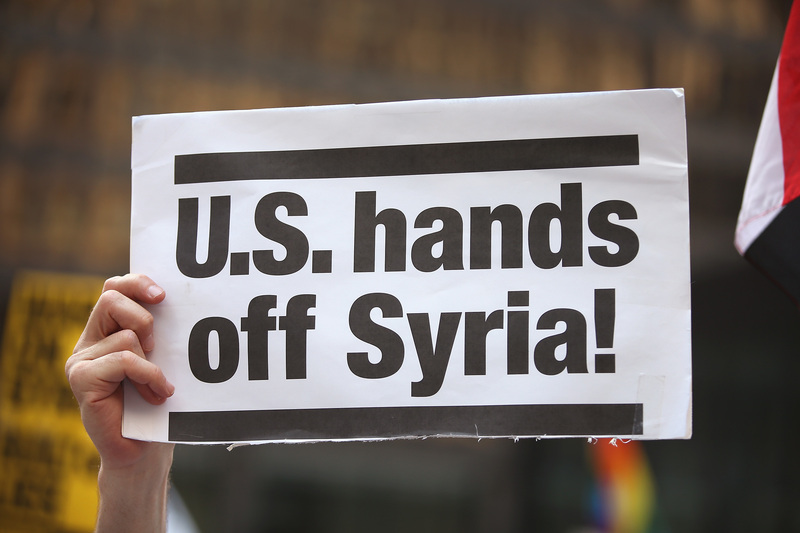 But the factions seem united in one front: they want America to intervene. Maybe it's to save them from the government's brutality, maybe it's just to bring to a head two years of bloody sectarian differences. Either way, they're not happy the U.S. is waiting. And they don't trust this so-called "deal." Judging from the way the Syrian government jumped at the possibility of a compromise, clearly Assad wants a diplomatic deal. Not only did Syria finally admit that it holds chemical weapons — a fact that it had been vehemently denying — it also agreed to sign the Chemical Weapons Convention. "Certainly, this is all reasonable, it will function and will work out, only if the U.S. and those who support it on this issue pledge to renounce the use of force, because it is difficult to make any country – Syria or any other country in the world – to unilaterally disarm if there is military action against it under consideration," Russia's President Vladamir Putin said on his ally's behalf. In other words: No military force — or no deal. Russia is of course one of Syria's biggest arms suppliers — contracts with the Russian defense industry have likely reached $4 billion, according to CNN. The country initially opposed UN Security Council resolutions holding the Syrian government accountable for the August 21 attacks.Now, Russia's pushing for a deal, perhaps because that's the most likely way to keep Bashar al-Assad in power. And it'll look pretty damn good for Putin if he can broker this deal as an unlikely peacemaker. The UN Security Council, whose name has been thrown around almost carelessly during the Syrian crisis, is suddenly seeing its shining moment. The U.S., its allies, and Russia are still trying to reach the deal that would put Syria's chemical weapons under international control, refer action to the International Criminal Court, and set up consequences if Syria fails to comply. They're trying to do just that through the council. The UN is not some kind of concrete 'system'. It is instead the rather mutable embodiment of international cooperation. In other words, it is strong when they cooperate, and weak when they do not. And such is the case now. It has suffered far worse damage and persisted – for better or worse – including, of course, damage inflicted by the US itself. It's all a game of politics now.